Haresh Khemani is passionate about Mechanical Engineering, and teaching and writing. In a career spanning over 17 years he has gained extensive industrial experience in the area of utilities, which provides him command in this field to teach and provide consultancy. Haresh has worked in the installation, erection, and commissioning of utility plants, such as air compression plants, water chilling plants, central air conditioning systems, chlorine liquefaction plants, diesel generators, and payloader etc. He has been responsible for the maintenance and operations of the above plants, along with boiler plants, and various types of pumps and blowers. As a lecturer at the SSVPS College of Engineering, Haresh has taught his favorite subjects including Refrigeration and Air Conditioning (HVAC), Thermodynamics, Automobile Engineering, Power Plant Engineering and Industrial Instrumentation. He has written course materials on HVAC and other subjects for multiple companies including IDC. 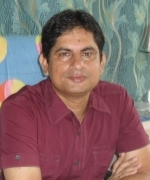 One of his major involvements has been with www.brighthub.com, where he and his team have published more than 2500 articles covering various areas of engineering. He has personally written more than 400 articles for the website. Over the years, Haresh has specialized in the fields of utilities of which HVAC is the major part. He has worked in the industry as HVAC consultant and has also written a number articles and course materials in this field.